ASLA’s 20 Professional Practice Networks (PPNs) provide opportunities for professionals interested in the same areas of practice to exchange information, learn about current practices and research, and network with each other—both online and in person at the ASLA Annual Meeting and EXPO. In 2017, the PPNs created 99 posts for The Field blog and 12 Online Learning presentations. Thank you to those who shared experiences on The Field and shared their expertise as Online Learning presenters! 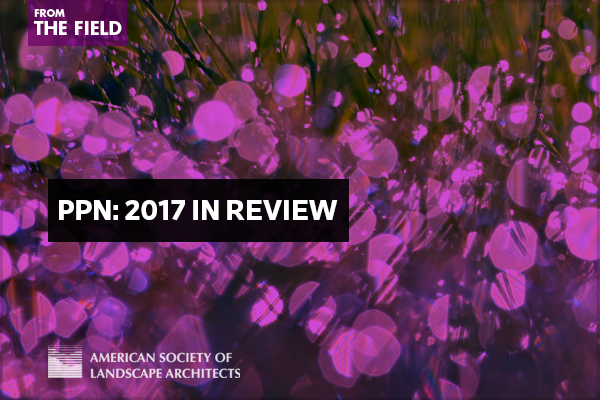 These opportunities are open to all ASLA members, and we hope to grow our group of PPN contributors in 2018.
the ASLA Online Learning Student & Emerging Professional SPOTLIGHT mini-series. 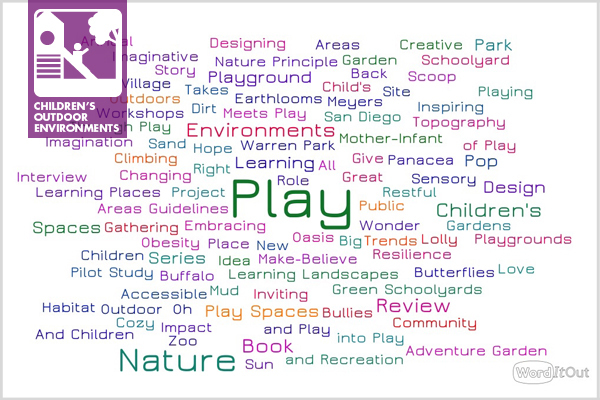 A Call for All Children’s Outdoor Environments PPN Authors! visited a compelling outdoor space that caters to children? heard about or attended an event or program that links children to outdoor places? successfully addressed a child- or family-focused design challenge? attended a child-centered conference that the Children’s Outdoor Environments Professional Practice Network (COE PPN) and other ASLA members should know about? If so, we invite you to share what you have learned and write a piece for The Field, the blog for ASLA’s Professional Practice Networks (PPNs). For more information, see The Field‘s Submission Guidelines. 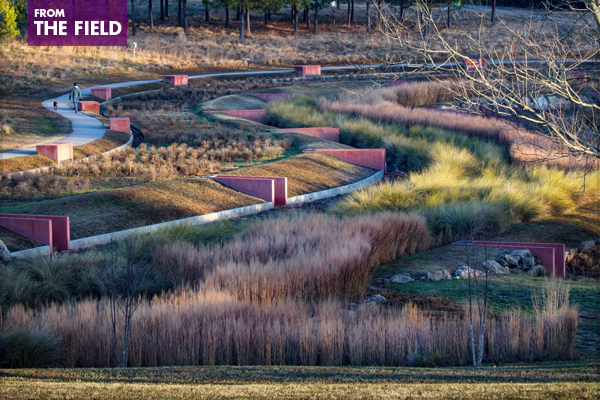 Content on The Field is authored by members of ASLA and organized by ASLA’s 20 PPNs, which cover a wide range of practice areas. The PPNs provide opportunities for professionals interested in the same areas of practice to exchange information, learn about current practices and research, and network with each other—both online and in person at the ASLA Annual Meeting and EXPO. 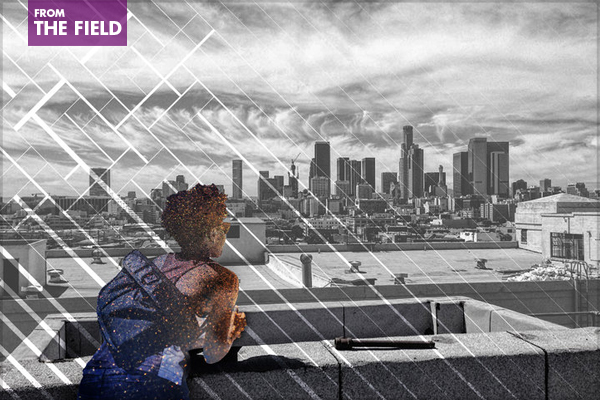 The Field was created to give members who work in landscape architecture a place to exchange information, learn about recent work and research, and share their thoughts about current happenings. We invite you to join the conversation! In October, the American Society of Landscape Architects participated in the National Building Museum’s Big Build to advance the quality of the built environment by educating attendees about its impact on individual lives. The annual event brings kids and parents from the D.C. region to the museum to learn about built environment professions and participate in hands-on activities. Over the course of a day, the museum welcomed 3,300 visitors to experience various trades, crafts, and passions. The Big Build had more groups than previous years and offered a variety of hands-on activities for visitors of all ages, from preschool age and up. This challenged kids and their parents to learn something new, try something they would typically never try, and think about the ways in which they could make the built environment better. 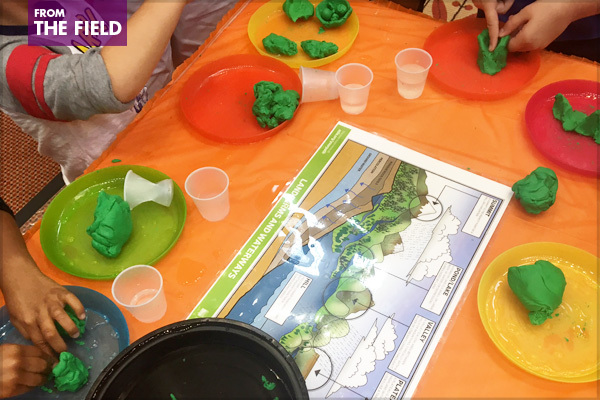 ASLA created a hands-on activity, Create a Landform: Discover How Water Moves on Land, that educated kids, teens, and adults about landforms, watersheds, and the importance of understanding stormwater management. Throughout the day, kids of all ages and their parents took part in the exercise and learned how landscape architects work with land and water. The Black in Design Conference is a biennial event that focuses on uncovering the complex dialogues related to the intersection of design and black identity. Hosted at the Graduate School of Design at Harvard University by the African American Student Union (AASU), the conference highlighted the works of emerging and seasoned design professionals, activists, artists, and educators whose common goals challenge Eurocentric methods of design, education, and engagement to create spaces and places for all people. The 2017 conference, entitled “Designing Resistance, Building Coalitions,” specifically focused on design as a social justice and activism tool that promotes equity and equality in spaces around the country that oppress or erase black and brown presence. For more information, visit the Black in Design website to watch the entire conference, and for the 2019 conference announcement. The Historic American Landscapes Survey (HALS) was created in 2000 to promote documentation of our country’s dynamic historic landscapes. Much progress has been made in identifying cultural landscapes but more is needed to document these designed and vernacular places. The 2018 HALS Challenge theme will be Memorialization, Commemorating the Great War. 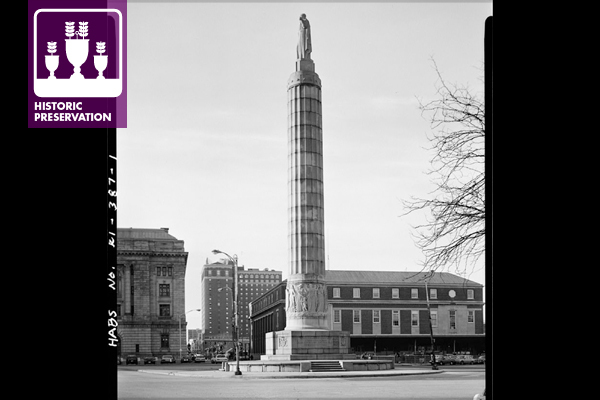 For the 9th annual HALS Challenge, we invite you to document a World War I memorial site to honor the centennial of the end of World War I, the war to end all wars. Not only were traditional monuments constructed across the country following the armistice, but “living memorials,” which honored the dead with schools, libraries, bridges, parks, and other public infrastructure, were designed to be both useful and symbolic at the same time. Perhaps you know of another monument, park, or public institution that is unrecognized. These sites are in all areas of the country, often hidden in plain sight. We challenge you to find them and document them. 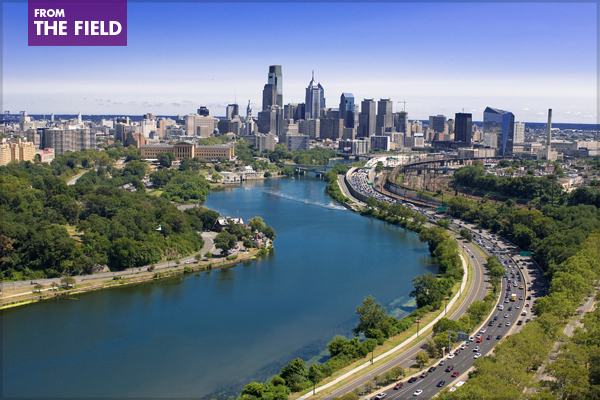 ASLA is now accepting proposals for the 2018 Annual Meeting and EXPO education program, taking place October 19-22, 2018 in Philadelphia. If you are interested in presenting and sharing your knowledge with the landscape architecture profession, we encourage you to submit a proposal through our online submission site. The goal of the annual meeting education program is to provide professional development opportunities which address the diversity of practice types in the profession. Help to ensure your voice is heard and your practice area is represented by submitting a proposal! In order to successfully submit a presentation for consideration, the following items are needed for each presentation: speaker names with a biography, a session title, marketing statement, learning objectives, outline, and sources. Submissions should speak to panel diversity and audience engagement. Additionally, all presenters must sign the speaker terms and agreement prior to the January 31 submission deadline. Please visit the submission site for detailed information, including speaker policies, tactical tips, sample submission materials, and a timeline of the selection process. ASLA members are invited to log in to the online system using their unique ASLA ID.